Göring, Alfred Rosenberg, Albert Speer, Joachim von Ribbentrop, and Rudolf Hess—he quickly rose to become the number two prosecutor in the U.S. contingent. Over the course of fifteen months, Dodd described his efforts and his impressions of the proceedings in nightly letters to his wife, Grace. The letters remained in the Dodd family archives, unexamined, for decades. When Christopher Dodd, who followed his father’s path to the Senate, sat down to read the letters, he was overwhelmed by their intimacy, by the love story they unveil, by their power to paint vivid portraits of the accused war criminals, and by their insights into the historical importance of the trials. 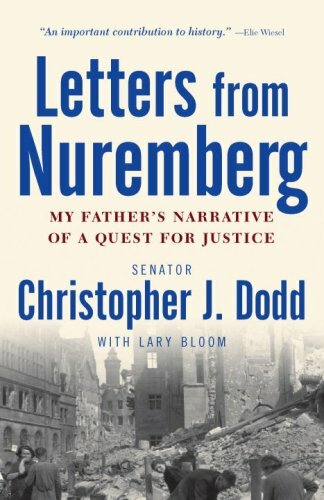 Along with Christopher Dodd’s reflections on his father’s life and career, and on the inspiration that good people across the world have long taken from the event that unfolded in the courtroom at Nuremberg, where justice proved to be stronger than the most unspeakable evil, these letters give us a fresh, personal, and often unique perspective on a true turning point in the history of our time. In today’s world, with new global threats once again put-ting our ideals to the test, Letters from Nuremberg reminds us that fear and retribution are not the only bases for confrontation. As Christopher Dodd says here, “Now, as in the era of Nuremberg, this nation should never tailor its eternal principles to the conflict of the moment, for if we do so, we will be shadowing those we seek to overcome.” From the Hardcover edition.